William Maxwell Evarts was born in Boston, Massachusetts, in 1818. He graduated from Yale University in 1837 and then studied law at Harvard University. He was admitted to the New York bar in 1840 and over the next twenty years became one of the nation's leading lawyers. In 1868 President Andrew Johnson chose Evarts to be one of his defence team during his impeachment trial. His four day summation at the end of the trial was considered to have played an important role in obtaining Johnson's acquittal. When the Senate rejected Henry Stanbury as Attorney General, Johnson named Evarts for the post. This time the Senate gave its approval and he served from 1868 to 1869. He also served as counsel for the United States at the Geneva court of arbitration (1871-72). 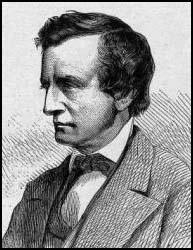 In 1877 Rutherford Hayes appointed Evarts as his Secretary of State. He lost office in 1881 but was elected to the Senate in 1885. He was forced to resign because of failing health and suffered total blindness for the last eleven years of his life. William Maxwell Evarts died in 1901.